Cameroon has arrested four soldiers suspected of shooting dead two women and two children in the country’s far north where its army is battling jihadist group Boko Haram, two security sources told Reuters. A video of the incident, which went viral on Twitter since it emerged on July 13, has provoked international outcry. Government spokesman Issa Tchiroma Bakary initially described the footage as “fake news” and said that the men in the footage, who were wearing military fatigues, did not appear to be Cameroonian soldiers. However, he said the government would open an investigation. A second security source said that three of the soldiers had been transferred to the capital Yaounde whilethe fourth was still being held in Maroua, the capital of the Far North. The shaky footage shows two women, one with an infant strapped to her back, being led across a patch of dusty scrubland by a group of uniformed men, who accused them of belonging to the Nigerian militant group, Boko Haram. The women, silent throughout the ordeal, were blindfolded and told to sit down alongside their children. Moments later, two men step back, level their rifles and fired series of shots. 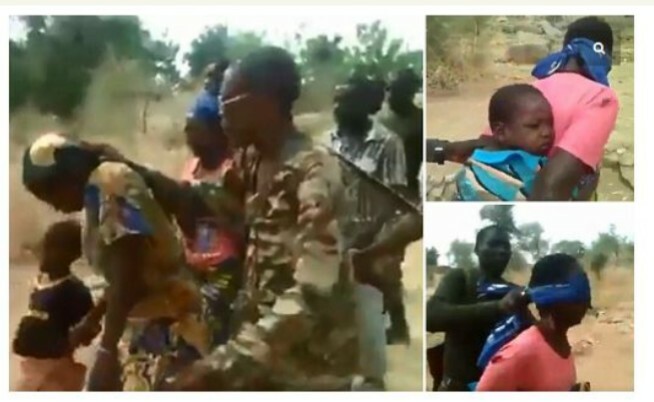 Amnesty International said it had gathered credible evidence that the men in the video were indeed Cameroonian soldiers based on an analysis of their weapons, speech and uniforms.